The French group is mulling the sale of its stakes in over three dozen regional banks, echoing a similar 2013 disentanglement by Natixis. 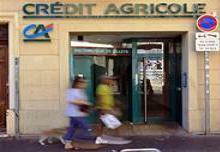 It wouldn’t end Credit Agricole’s cumbersome mutual structure. But greater simplicity, plus a potential cash payout, would be welcome. Credit Agricole Group said on Jan. 19 it was working on a plan that could see its listed entity, Credit Agricole SA, sell its 25 percent stake in over three dozen French regional mutual banks that themselves collectively own over half of Credit Agricole SA shares. The French financial institution said that the move, which would involve an intragroup transfer of so-called CCA/CCI instruments held by Credit Agricole SA, would have no impact on group solvency and no significant tax effect. It also said it would strengthen the bank’s 50 percent dividend payout policy, and enable the payment of an exclusive cash dividend, potentially for the 2016 fiscal year. Credit Agricole shares had risen 3.8 percent to 9.4 euros as of 1030 GMT.